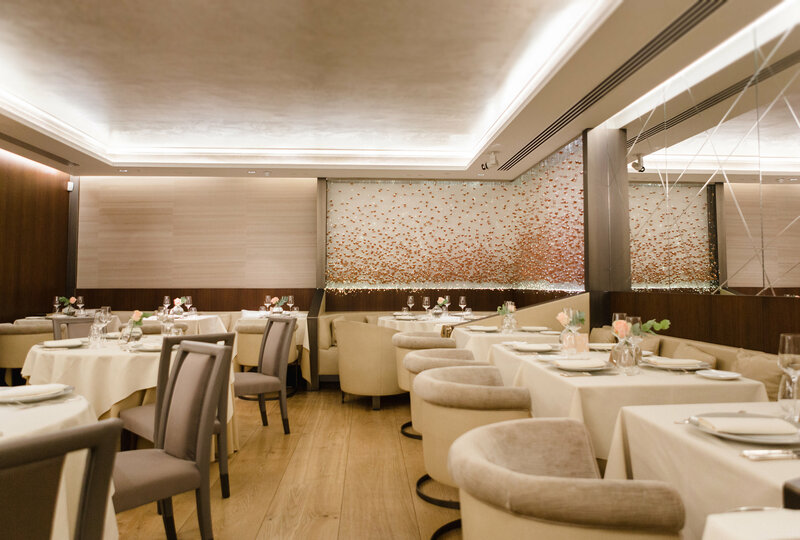 This September saw the re-launch of the Mayfair-based Quattro Passi restaurant. Now more informal and relaxed, even the name has been revamped into something a little less formal; QP LDN. The ethos behind the restaurant is to serve fresh, high-quality ingredients and inventive Italian cooking beautifully presented in a relaxed and vibrant setting. It does that and more. The ingredients are flown in daily from Italy, and under the direction of two Michelin-starred chef / owner Antonio Mellino and his two sons, Raffaele and Fabrizio, the restaurant serves culinary delights based on the cuisine of the Amalfi coast. Mellino is world renowned in culinary circles for his expertise in pasta making, he’s brought that knowledge to the QP LDN and created such exquisite dishes as Risotto Con Scampi E Pesche (langoustines risotto with peach), Gnocchi Con Gamberi, Pomodorini E Rucola (gnocchi with prawns, cherry tomato and rocket) and Capesante Su Salsa Di Aglio Selvatico E Rapa Rossa (scallops with cream of wild garlic and beetroot. All pasta dishes can be created with gluten-free pasta options, and Mellino has introduced a variety of super food salads to the new menu, these include Insalata Di Quinoa, Melograno E Verdure Croccanti (quinoa salad with pomegranate and mixed-vegetables) and Insalata Di Rapa Rossa, Formaggio Di Capra E Ceci (beetroot and goat cheese salad with chickpeas). Such is Mellino’s reputation, that he can consider dignitaries like Prince Andrew and King Juan Carlos of Spain regular clients, who find themselves amongst celebrities like Kylie Minogue, Hugh Grant, Anne Hathaway, Valentino and ex-Secretary General of the United Nations, Kofi Annan. It must be said however that despite being located between the Victoria Beckham and Christian Louboutin boutiques, this restaurant isn’t a celeb hangout because it’s cool (although the interior is quite simply stunning), it’s because the food is second to none, definitely not a case of style over substance. Speaking of cool; the interior is a mixture of high-end contemporary design and modern artwork, including triangular shaped wall sculptures finished in bold primary colours, hand-sculpted leather wall finishes, French silk wallpaper and what must surely be the centrepiece, an illuminated marble-style staircase and bar. Al fresco dining can also be accommodated, and in something that seems so alien in this age, QP LDN is happy to advertise a socialising and smoking area in the outdoor sidewalk terrace. Perhaps that’s the European influence. Underneath the restaurant, you’ll find the QP Lounge; built to celebrate the glamour of the Dolce Vita lifestyle, with Italian design elements and styling featuring heavily. Features include Italian-made glassware, glass wine room, colourful contemporary seating, stylish Italian cinematic artwork and the showpiece illuminated bar. The lounge is the perfect place to relax after dinner, or for a night out with friends and family, enjoying the eclectic mixture of live entertainment and internationally renowned DJ’s.